Growing up in the Dade County school system, and graduating from college in Florida, Pérez Firmat was insulated from America by the nurturing sights and sounds of Little Havana. 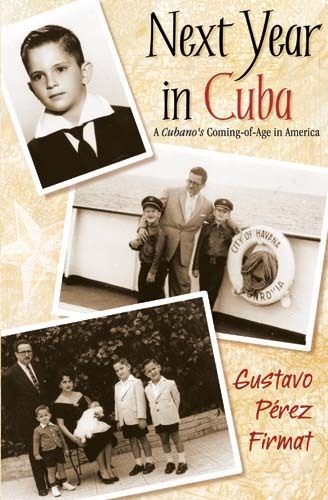 It wasn’t until he left home to attend graduate school at the University of Michigan that he realized, as the Cuba of his birth receded farther into the past, he had become no longer wholly Cubano, but increasingly a man of two heritages and two countries. In a searing memoir of a family torn apart by exile, Pérez Firmat chronicles the painful search for roots that has come to dominate his adult life. With one brother beset by personal problems and another embracing the very revolution that drove their family out of Cuba, Gustavo realized that the words “Next Year in Cuba,” had, for him, taken on a hollow ring. Now, married to an American woman, and father to two children who are Cuban in name only, Pérez Firmat has finally come to acknowledge his need to celebrate his love of Cuba, while embracing the America he has come to love.